The extraordinary daughter of Cleopatra and Mark Anthony seeks to reclaim her birthright in the first novel of an epic historical fiction trilogy from the New York Times bestselling author of America's First Daughter. With both of her parents dead, Princess Selene and her two surviving brothers are left at the mercy of their captors, taken from Egypt and put on display as war trophies in Rome. Trapped in an empire that reviles her heritage and suspects her faith, Selene struggles for survival in a court of intrigue. She can’t hide the hieroglyphics that carve themselves into her hands, nor can she stop the emperor from using her powers for his own ends. Stephanie Dray is a New York Times, Wall Street Journal, and USA Today bestselling author of historical women’s fiction. Her award-winning novels include America's First Daughter and My Dear Hamilton, co-authored with Laura Kamoie, and the Cleopatra’s Daughter Trilogy. Her work has been translated into eight languages and often tops lists for the most-anticipated reads of the year. Before she became a novelist, she was a lawyer and a teacher. Now she lives near the nation's capital with her husband, cats, and history books. In antiquity, girls were considered to be grown women at the age of twelve, but what experiences in Selene’s life made her older and wiser than her years? How do the powers Cleopatra gives to her children suit each of them, and do you think their characters would have changed had they been matched with another power? What role does Selene’s twin brother play in her life? How does her relationship with him differ from any of her other siblings? Selene learns to lie at a very young age and we watch her evolve into a schemer. Can these traits be forgiven as the tools of survival or do they represent a fundamental weakness in her character? In what way does Selene become more like the emperor than she is like her mother or father? There is an emphasis placed on magic throughout the novel. Discuss what magic is to the Romans and the attitude that they hold for it, as well as what magic means to Cleopatra’s children and the followers of Isis. Are their attitudes at all similar and how do they change throughout the course of the plot? In the middle of the book, Selene abandons her faith and removes her frog medallion. Why do you think she turns her back on Isis when she seems to need her most, and how does this decision impact the story? Julia faces a harsh reality when she realizes that she has no choice when it comes to her future. Every decision is made for her and serves a specific purpose for Caesar. What do you wish for Julia, and what kind of woman do you think she will become? While much is known about the allegedly scandalous Cleopatra, her more cautious daughter is virtually unknown. Why do you think this is? Cleopatra’s death has caused speculation and sensationalism for centuries. Given accounts that Octavian called for snake-poison healers to try to revive her, and her subsequent portrayals in his triumph, it has long been believed that she died by the poisonous bite of an Egyptian cobra. More recent theories include the idea that she was poisoned or was forced to kill herself because she was an inconvenience to Rome. How do you think she died? After Cleopatra’s death, Rome went through a period of Egypomania, fueled, in part, by Octavian himself. Why do you think he remained so fascinated with the country and the woman he had conquered? It is said that Caesarion was killed because “two Caesars is one too many.” But Antony’s son Antyllus was also killed along with Selene’s cousin Petubastes of the priestly family of Ptah. What does this tell us about Rome’s intentions towards Egypt? One of the most noticeable features of Rome today are the many obelisks that were transferred from Egypt and placed around the city. In the book, Selene takes notice of Octavian’s obsessive behavior towards her mother. How did it benefit him to keep the legend of Cleopatra alive? The society of Egypt and that of Rome are often compared throughout the novel. One serves as a symbol of success through a fostered liberty under a monarch, and the other serves as a symbol of success through organized power under the guise of a republic. How do both of these symbols interact throughout the novel and why do you think it is important to see them functioning side by side? The month of August is named after Octavian. What other traces of his rule can be found in the world today? Rome was generally very tolerant of religious diversity in the peoples that they conquered, but during the Age of Augustus, the Isiac faith was actively persecuted. Why? Selene was born approximately forty years before the birth of Christ, and was heralded upon her birth as a savior. The entire ancient world was awaiting a Golden Age. What light does this shed upon Christianity? And how might Jesus have fared differently if he had been born into a world ruled by Cleopatra and Antony’s heirs, rather than Augustus’ successors? Isiacism was one of the first religions of the ancient world to concern itself with social justice. Slavery, warfare, and care for the less fortunate were themes these religions addressed, to the consternation of the ruling elite. How have these traditions come down to us today? Virgil’s Aeneid was, as they say, an instant classic. Commissioned by Augustus, and passed down as the quintessential creation myth of the Roman state, it tells Rome’s story as the Romans themselves would have wanted us to see it. Was Augustus wise to hire a cadre of esteemed artists such as Virgil to create his propaganda? 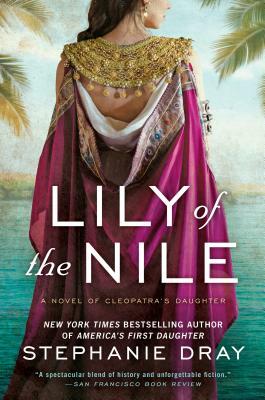 Lily of the Nile examines the hardships of even a high-born Roman woman’s life and the lengths that society went to preserve a woman’s sanctity and meekness. Selene’s antithesis, Octavian, shadows his household’s every decision. How does his presence and his beliefs shape the plot of the novel? How would the plot change had he not been adherent to his strict policies and viewpoints on the role of a Roman woman? Could Selene’s story be used to empower young women in society today? Why or why not? Are there any parallels between the decisions that she has had to make for her family and the decisions some young women make for their families today? How did Augustus’ morality and attitudes towards women shape Rome and influence our society even today? Selene had a variety of female role-models to choose from. Her mother. Livia. Octavia. And even Marcella. How do each of these women embody a different approach to the patriarchal world into which they’d been born? Discuss the personalties of the male characters and their contribution to the storyline. What were the expectations for a Roman man, and how does this impact Juba, Helios, and even the sickly emperor himself?